Let’s face it, standard air compressors are loud. All this noise interferes with workplace communication, lowers productivity on the job and increases risk of hearing loss. Fortunately, Flexzilla brings quiet back to the workplace with Quiet Technology Air Compressors (FXS10V120V1) featuring low RPM pumps and motors that reduce high frequency noise levels while increasing CFM output. 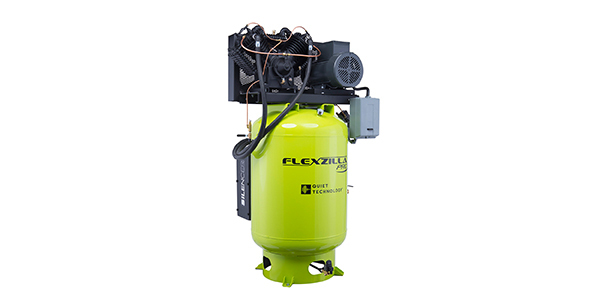 Plus, Flexzilla Stationary Air Compressors add the Silencer, a patent pending noise suppression system that reduces low frequency noise levels. Flexzilla Air Compressors are the quietest on the market emitting operating noise no louder than a normal conversation. For additional information, visit Legacy Manufacturing, Flexzilla.